Speed Limits: Traveling at an unsafe speed is probably one of the most common causes of auto accidents especially freeway collisions. CVC Section 22350 provides the general duty of motorists to drive at a speed that is safe for all conditions including “weather, visibility, traffic, surface area and width of the highway”. The so-called “prima facie” speed limits depend upon the roadway and can be set by state and local authorities but, in general are as follows: 65 miles per hour on most highways and freeways per CVC 22349; highway intersections and surface streets generally have limits specified in California Vehicle Code 22352 as follows:Fifteen Miles Per Hour: In and around railroad crossings, when traversing the intersection of a highway, and in all alleyways. Twenty Five Miles Per Hour: On highways that are not designated as State highways and in all business and residential districts unless the local authorities mandate otherwise and when approaching or passing either a school during school hours or a senior care facility.In addition to prohibition of excessive speed, likewise driving at such a slow speed that it impedes the reasonable movement of traffic is also prohibited under CVC 22400(a). Driving on the Right Side of The Road and Passing of Vehicles: In head on collisions and cases where vehicles are run off the road or have to swerve, the primary factor is usually the failure to stay right and not pass in no passing zones. In general, all vehicles must drive on the right side of the roadway under CVC 21650 unless they are overtaking and passing (21650(a)), turning left (21650(b)) or when the right side of the road is closed to traffic because of construction or repair (21650(c)). Passing over double yellow lines is prohibited except when turning into to a driveway or in certain turn lanes. (CVC 21460(a)). The Duty to Signal An Intent to Turn: Many times, drivers who cause traffic collisions fail to properly communicate an intention to turn prior to the turning movement. CVC 22107 and 22018 require such a signal for a distance of 100 feet prior to the initiation of the deviation right or left. 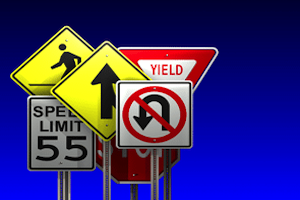 Intersection Traffic Safety Laws: There are many California Vehicle Code sections that apply to persons approaching, passing through or turning in and around roadway crossings. Section 21800 applies to intersections not controlled by lights or signs and states that a motor vehicle approaching an intersection must yield the right of way to vehicles approaching from a different highway, vehicles that have entered the intersection first, and, in general, requires that the vehicle on the left yield to the one on the right. Section 21452 states that a driver facing a yellow traffic light is being warned that a red light is imminent. Section 21453 requires all automobiles to come to a complete stop prior to the limit line when facing a red, steady circular traffic signal and prohibits entering or turning on a red turn signal prior to the light changing to a green arrow. Finally, CVC 21802 mandates that any vehicle approaching a stop sign should come to a complete stop and yield the right of way to other vehicles which are close enough to constitute an “immediate hazard” and should continue to yield until it is safe to proceed. The driver may then proceed and all other approaching vehicles must yield the right of way to the vehicle entering or crossing the intersection. Prohibition Against Following Too Closely : Following too close to the vehicle in front of you or “tailgating” is a major cause of freeway accidents and rear end collisions in or around intersections on surface streets. CVC 21703 states that persons should not follow behind each other “more closely than is reasonable and prudent” given the speed of the car in front and the traffic and roadway conditions. Left Hand Turns: In general the party intending to turn left across oncoming traffic or make a U-turn has a duty to not initiate the turn unless and until all approaching vehicles are a sufficient enough distance to not constitute a hazard. (See CVC 21802). This means that the party turning left must yield to persons coming from the opposite direction. Changing Lanes on A Highway or Surface Street: CVC 22107 states that no vehicle may turn a vehicle from a direct course either to the right or left until the movement can be made with reasonable safety and only after providing an appropriate signal. Making unsafe lane changes without checking both rear and side view mirrors and signaling is a major cause of “sideswipe” accidents that can result in vehicles (especially motorcycles) from being run off the road. Prohibited Stopping and Parking: In general vehicles cannot and should not be left attended or unattended in intersections (not adjacent to the curb), within a crosswalk, in a no parking zone as indicated by a red-painted curb, within 15 feet of a fire station, in front of a public or private driveway, on any portion of a sidewalk, alongside a street when it obstructs traffic, alongside another vehicle already parked (i.e. double parking), alongside curb space authorized for the loading and unloading of passengers of a bus or other common carrier, in a tube or tunnel, upon a bridge, or in front of any portion of a curb that has been constructed to provide handicap or wheelchair access. (CVC 22500) Section 22517 also provides that a parked vehicle may not open a door on the roadway side until safe to do so. Driving Under the Influence of Alcohol or Drugs: Driving under the influence of alcohol or drugs is obviously prohibited for good reason as impairment due to these substances impedes the ability to safely operate a motor vehicle. (See CVC 23152 and DUI Accident Claims in California blog post). Duty to Properly Maintain Equipment on Vehicles: All automobiles, trucks and SUVs are required to be maintained in safe working order which includes headlamps and rear brake lamps including turning signals, brakes and parking brakes (CVC 26451 and 26453). In the case of commercial trucks, there are additional requirements for maintenance and regular safety inspections as well. (CVC 2813). What Effect Does a Violation of one of These Vehicle Code Sections Have on a Civil Claim for Damages for Bodily Injury and or Property Damage? California tort law states that every person is responsible for both willful acts and acts or failures to act in a way that injures another person due to a lack of ordinary care or skill. (California Civil Code 1714). This is known as negligence. If a person violates a statute that is meant to protect a class of persons and in a manner intended to be protected by law, this can be “negligence per se” (i.e. the person is presumed to be negligent if their statutory violation was the cause of injury or wrongful death). It is always important to have an experienced California personal injury lawyer examine these issues in any motor vehicle accident claim so that the right assertions can be made to maximize the chances of finding the responsible parties to be liable for damages.